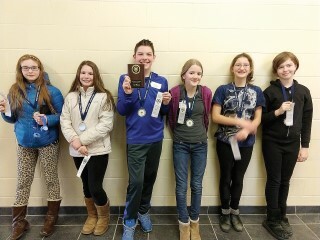 Windham Middle School's (WMS) Odyssey of the Mind team placed first in the Discovery Region Odyssey of the Mind Tournament on Sunday, March 17. The WMS team chose a challenging, non-verbal long-term problem called, "Emoji: Speak for Yourself", which they will reprise in the Odyssey of the Mind State Tournament on Saturday, April 7. Wish them luck! Not pictured: Coaches Dan Knott and Jon Paulding. Five members from the string section of the Portland Symphony Orchestra played 3 Kinderkonzerts for the Windham Primary and Raymond Elementary School students on Tuesday, March 27th in the Windham Performing Arts Center. Concerts were funded by the Windham PTA and the Windham Primary School Cultural Arts Committee. 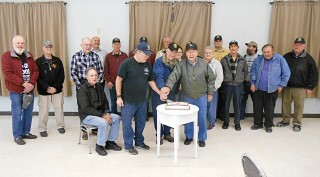 Field-Allen Post 148 Veterans Coffee celebrate their second anniversary gathering. for 204 consecutive weeks the Vet Coffee Social has been providing an opportunity for local veterans to gather and socialize over coffee and donuts at the Windham Veterans Center (WVC). Around the table left to right, Post Service Officer, Chuck Whynot, founder of the Vet Coffee; Richard Drapeau, the newest Post Member; and Carroll McDonald, the oldest Post vet in attendance (WWII). In the background some of the 30 plus vets who stopped by to celebrate the 2nd Anniversary of the Coffee. All vets are invited to drop in any Wednesday at the WVC from 9 to 11 am for Coffee and donuts.